Updating the progress on the craft show displays. They are pretty much finished just waiting for the paint to dry at this point(won't be as shinny). The display is much bigger then I can fill up at this point but it will allow me to have room to grow. 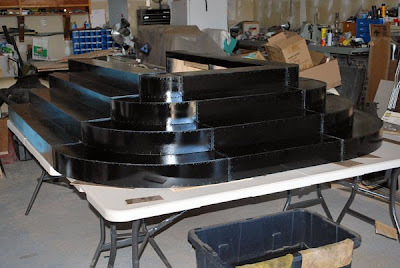 I can customize it by using more or less sections depending on the space at the shows and how much product I do have. Just need to get table cloths and then a nice wind free day and I will do a test set-up to see how everything looks. New scent! Basil Nectarine is juicy notes of ripe nectarines blended perfectly with leaves of the freshest basil. It's fruity, herbal and irresistibly inviting! 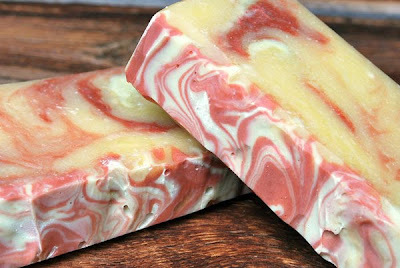 I have had this scent sitting around for a long time and it I knew I wanted to make soap with it but for some reason it took me awhile to get around to it. 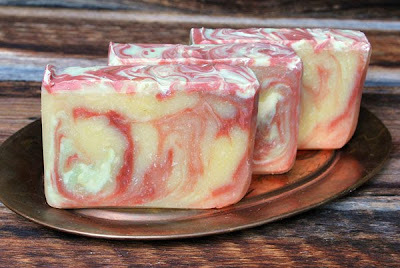 Loving the herbal notes in this soap. 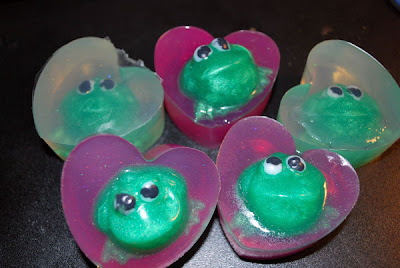 So the colors didn't come out like planned I had used a copper and emerald mica and it looked great in the mold. But when I pulled it from the mold the green was gone, it is still nice looking but it was even better before. 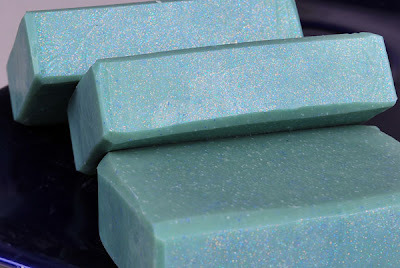 Mental note emerald green mica doesn't work in cp soap! 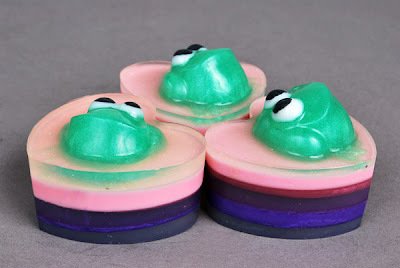 Going to be making fresh batches of Basil Sage Mint and Lavender soaps tonight. I have been trying to make them all week but just haven't found the motivation to get in there yet. 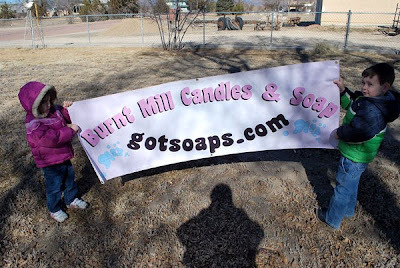 So if you have read my Bio you know my company is named after the ranch my grandma lives at on Burnt Mill Rd. 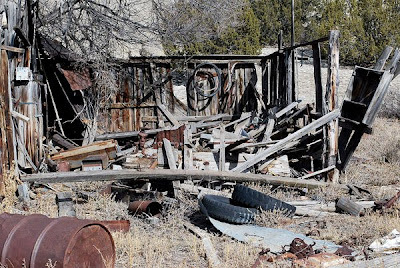 Her ranch is a homestead which means our family has lived on it for generations and she can remember lots and lots of houses and buildings that have come and went. Well I went out to visit today and to look for a new background for taking my pictures. 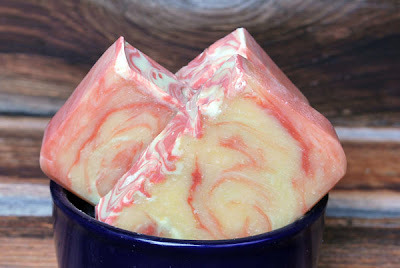 I was searching for something to help warm up my pictures some yet still be simple and not take away from my soaps. 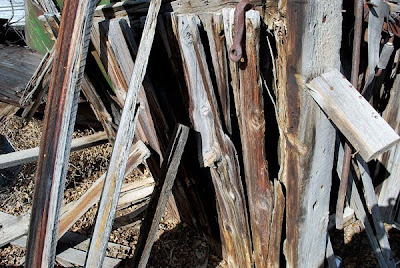 What I found was very old barn wood which is all over the place there. 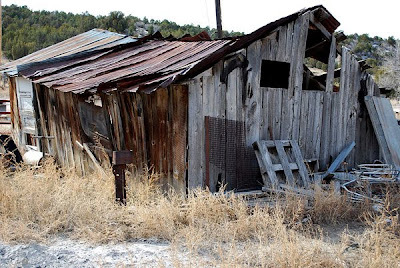 Many old buildings are still there and barely standing as you can see from the pictures. This wood is so amazing the colors in them are out of this world. When my mom saw it tonight she said she wanted some to put up on a wall because it was very pretty(she grew up on this ranch). 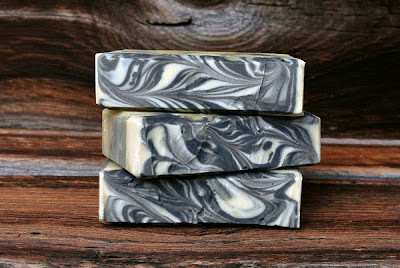 See bottom picture this is the newest batch of Stonehenge type soap taken on this wood. I think it is a keeper for sure what do you all think?!?!? 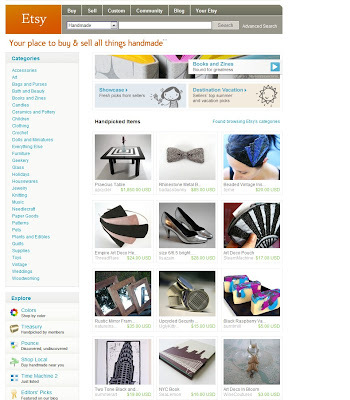 I made the front page of etsy!!!!! SO happy today!!! 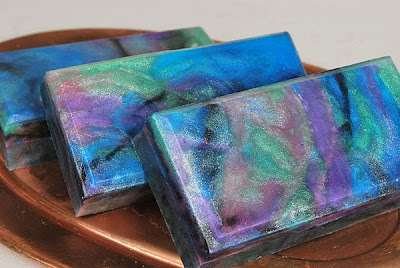 My Black Raspberry Vanilla soap made it to the front page today on etsy. I have been working hard to get to the front page for ages, it has been one of my goals. Every picture I take I try to think will this look good on the front page. Made a fresh batch of love spell type and I changed the colors again. 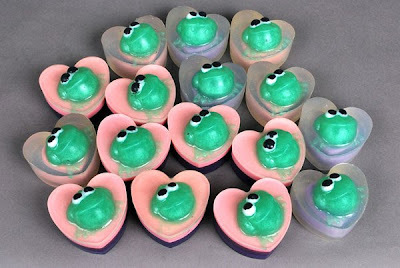 This scent has been solid pink with black jojoba spheres, the current batch is pink with green swirls and black jojoba spheres. 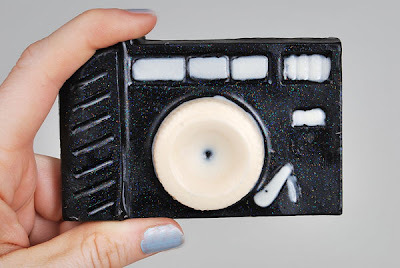 This new one has sparkle dust from soapy love (which I am totally in love with) on the top click the picture to see it better. I also included white and blue jojoba spheres but they are a finer grain so they aren't really noticeable. 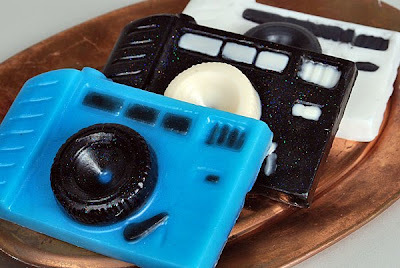 So I got two new soap molds yesterday and I was having lots of funing playing around with them. 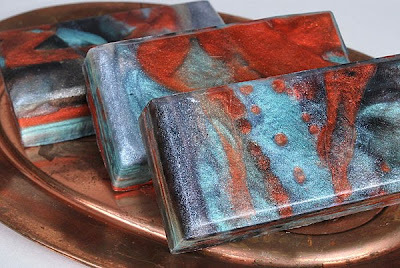 Lychee Red Tea(top), Jeweled Citrus(2nd) and the Camera soaps are all kinds of fun scents from blueberry cobbler to vanilla frosting. Been working on inventory and I finally sat down and actually made a list of every scent I have available. I have updated my listings on etsy where you pick the scents with that full list of scents so check them out! 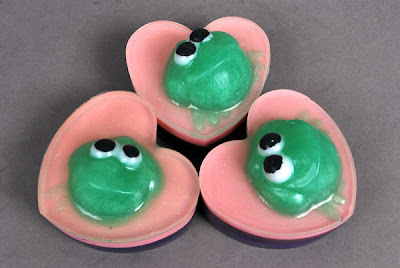 So I was out digging in my mold pile and came up with a cute idea for a valentines day soap. Took me some testing(see bottom pic for first ones made) to get them looking better but I think they are coming along pretty good now.